Weather and Roads for Leetonia this weekend. Just thought I would drop a note to anyone considering coming up in the next few days. The snow is now being covered with freezing rain. It is extremely slippery to walk or drive. Don't even THINK of driving back here without chains. It is also helpful to have cleats for your shoes should you get stuck. There is nothing worse than getting stuck then getting out of your vehicle only to fall on your face. I wish I didn't know that one by experience. These are the days even the animals have trouble. I was once told of an ice storm so bad deer broke their legs trying to walk and many had to be humanely shot. During that event there were many more deer than now. Many times when the weather gets bad you can see the deer sleeping on the sunny sides of the mountain in an almost hibernation type mode. They move as little as possible to save energy. Moving as little as possible sounds good to me and Lee so we are both waiting for nicer weather to venture out. Mountain girl, Paula, logging out. I am back! Leetonia Lee did such a good job while I was gone we might have to get her to write a little more often. 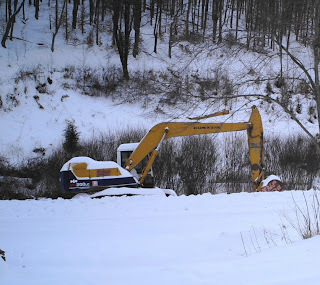 Looks like the excavator left by the township will be with us for the winter. They waited too long to move it and it is pretty much snowed in. The stack of firewood for next winter is also feeling a wintery blanket of snow. 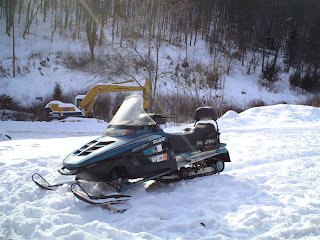 The snowmobile is ready for any problems the township may have with getting us plowed or getting to cabins that never get plowed from here. Our snowmobile is pretty old and doesn't have some of the smooth riding features of the newer models. So I have to say we don't ride it for fun. I use it to make a trail for my cross-country skis and for short trips around Leetonia. When I drove back to the woods with Lee, Sunday, I felt good again seeing the trees and the mountains. I just don't feel at home without them. My first day back was greeted by a cold artic blast. Thirty mile per hour winds took our cabin to a brisk 48 degrees when I woke up Monday. Leetonia Lee should be called Polar Bear Lee because she likes it cold. I am sure if I or the dogs didn't complain not much firewood would be burnt above 50 degrees in the house. We are a spoiled lot compared to the pioneers of the area who often had frozen water in their buckets to melt before they could make coffee. Of course they didn't have to worry about pipes freezing, since they didn't have any. They kept on heavy clothes and didn't take baths in the winter. I am sure by Spring it was a pleasant change to get really clean. This time of year brings a lot more work to my work. It is harder to get materials into jobs and to get to the jobs to do anything. I think often much of my work involves getting to work and setting up rather than getting much done. We passed the shortest day of the year on Sunday so with more light everyday we will have more and more time to get things done. Mountain girl, Paula, logging off. Six plus inches of snow and ice with cancellations! Paula's flight from Chicago was canceled due to the snow storm. She is going to try again Sunday but we have snow in the forecast for Sunday also. She's going to have to look on the bright side of having more time to spend with the Grand kids. They are thrilled. If this weather keeps up she may be spending Christmas in Illinois. The storm started off with freezing rain followed by 6 or more inches of fluffy snow. It isn't good packing snow. I couldn't even make a snow ball. Currently it is back to freezing rain. 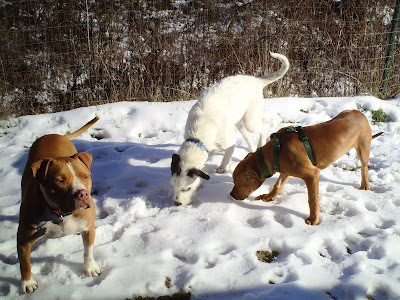 I took the boys for a walk and had a difficult time because it was so icy under the snow. We followed the track of one lonely snow mobile. That is the only evidence of anyone in the area. I won't be driving until they plow and cinder the road. Walking is hazardous enough. Scooter is thoroughly enjoying the weather. He blends in so well I have to really look for him when he gets ahead of me. Leo and Thor were relieved to get back home by the fireplace. Their legs are shorter than Scooters which makes it harder to trudge through the snow. Also they don't have a warm coat like Scooter. 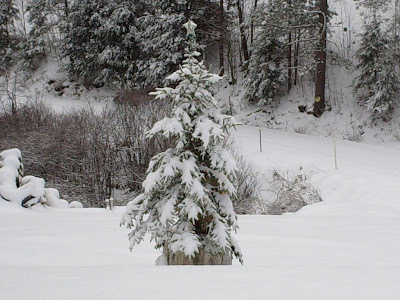 It looks like we are going to have a white Christmas in the Leetonia area this year. It's hard to believe it's just around the corner. Where did the year go? 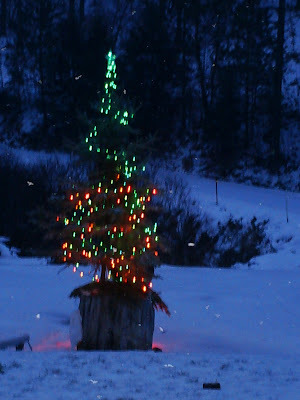 We are focusing on a healthy, safe and abundant year for 2009 and wishing the same for all of you. Leetonia Lee logging out. Looks like we are going to have 5 to 8 inches of snow on Friday the 19th. Of course there will be a wintry mix at some point in the day to make it extra special. Saturday will be mostly cloudy and then more wintry mix on Sunday. Temperatures will range between 11 and 29 degrees over the weekend. The plowed part of Leetonia Road is good except for a few icy spots that didn't catch the cinders. I traveled down to Cedar Run on the non plowed part of the road today. I pulled over to the side of the road just past Leetonia to let 2 snow mobiles go by. The road is tricky due to the ice under the wintry mix that is on top. I made it to Cedar Run traveling slowly and very carefully. Friday will be a different story. I expect more snow mobiles up for the weekend so if you plan to drive to your cabin take extra care and watch out for the snow mobiles. The picture of the melting snowman is on the road going toward Cedar Run just before the swimming hole by Nightingale Camp. The picture of the road is somewhere in the same area. Weather permitting Paula will be flying into Elmira Friday night. She is homesick so hopefully she won't be delayed by the weather. Scooter keeps looking for her. He misses going to work with her. Leo is just interested in his food, walks and keeping warm. Thor is adjusting well and finally being accepted by Leo and Scooter. Hope this helps any one who wants to venture here for the weekend. Logging Off, Leetonia Lee. The picture of the Christmas tree I posted Thursday versus the picture I took of the same tree today tells the story of the snow we got last night. Six inches of new snow fell in some areas which make the roads much more difficult. My guess is not as much snow came down in the Cedar Run area. We usually get more snow and lower temperatures closer to Leetonia. All the pine trees are weighted down by the snow. It's a winter wonderland but hard for traveling. The electric went out last night and then again this morning for about 5 minutes. We are likely to have more power outages today. It seems like power outages are a regular occurrence any more. So bring your chain saws in case trees end up down, your generators and chains. There was a wintry mix all day and now it is snowing. We are supposed to get 2 to 4 inches by morning. Saturday and Sunday are mostly cloudy with only 10% chance of precipitation. Temperatures will range between 13 and 36 degrees. Today I traveled to Galeton and it was slow going but good where it is plowed and cindered. I also went to Leetonia and there is at least an inch of packed snow and ice on the roads. I didn't have trouble with a Subaru that has studded snow tires but if you don't have at least 4 wheel drive it will be difficult especially with the added snow coming tonight. Remember there is ice underneath the snow so take precautions if you drive up this weekend. I know many are trying to get that last day of deer hunting in. I talked to one of the Lowe brothers today and he said he wasn't seeing any deer. It was raining and sleeting when I saw him driving looking for deer. I told him the deer are taking cover just like the hunters. I finally got the pictures to load. I hope everyone has a good, safe, warm weekend. Leetonia Lee, Logging off. Paula's daughter Mary came through with the pictures. 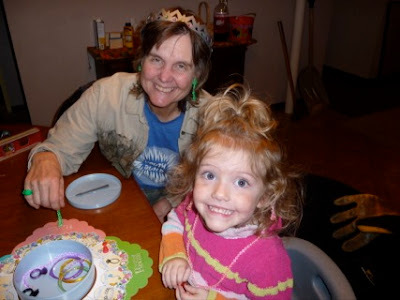 As you can see Paula is having quite a time playing with the grand children. She will have to savor every moment. The first picture is Paula with Ella. 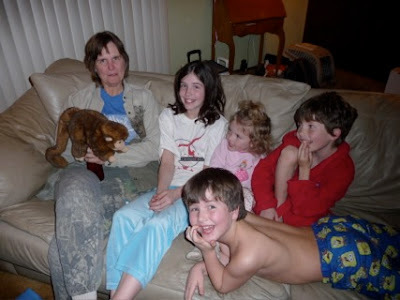 The second is Paula, Reilly, Ella, Joel and Sam laying on his stomach. Paula is holding their monkey puppet. It has been quiet in the woods today. Everyone is probably in Wellsboro at the Dickens festivities. I plan to hibernate for the most part while Paula's gone so I will post only if something newsworthy comes up. Later. Mountain Girl Lee leaving the site. Today I took Thor into Wellsboro to get his shots and buy a camo sweatshirt for him. I think I should have gotten it a little bigger although he seems to be comfortable in it. Wellsboro is bustling getting ready for Dickens Days. I stopped to visit Willow and Charlotte at An Enchanted Boutique. They have a good sale going on now. They moved to a new location which is upstairs in a building on the corner of Main St and East St. So if you are going to Dickens make sure you stop and tell Willow that the mountain girls sent you. Paula's daughter Mary left me a message that she is emailing me a picture of Paula which is quite pretty. So that will probably be my next post. I know you all will be waiting with baited breath to see that picture. Last night the temperatures dropped freezing all the slush on the road and then it snowed 1 to 2 inches. Needless to say there are some slippery spots. The part of the road that gets plowed is good. I didn't travel on the other part so I'm not sure how it is. Please be careful if you drive up here this weekend. I would like to send a special hello to my sisters Diane and Michal and my Dad Fred. They live in Illinois and love to see whats going on in the mountains. Diane and Michal have both visited us and would love to move up here. Also a special hello to Brad and Joan. We miss you. Mountain girl Lee logging off. I didn't have any trouble getting from Leetonia to Cedar Run today. Traveling from Cedar Run to just before the narrows going into Leetonia the road was mostly muddy with slush in places and then ice in the Red Rock area. From the narrows into Leetonia the road was slush and ice. The part of the road that is plowed has cinders but there are still some slick spots to watch out for. The temperatures will be dropping with highs in the 20's and lows in the teens for the weekend. That means everything will freeze up again. Some flurries are expected but at this point they aren't predicting much. We advise all those coming up for the weekend to drive cautiously and be prepared preferably with studded snow tires and chains. 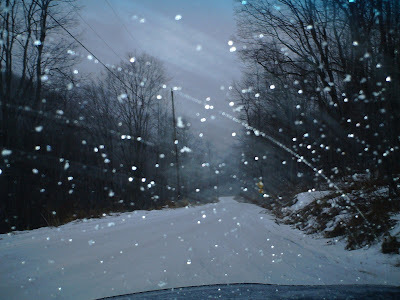 The road conditions change quickly with temperature and precipitation. The ditch has had some visitors lately so be careful not to be a statistic. The problem seems to be when someone is coming from the other way. I took Thor with me to Cedar Run today to show him off to Charlotte and Phil at the Cedar Run Inn. Charlotte couldn't believe how calm he is for a puppy and how well he gets around. He is fast becoming a popular mountain dog. This is other mountain girl Lee logging off for now. Paula made it safely to Illinois. Her grand kids couldn't wait to see her. They always want her to play the bear game with them which is her being the bear chasing and catching them. I'm sure she is going to need a long rest when she gets home. In the meantime the boys and I are hanging out. We took a walk back to the pond this morning. 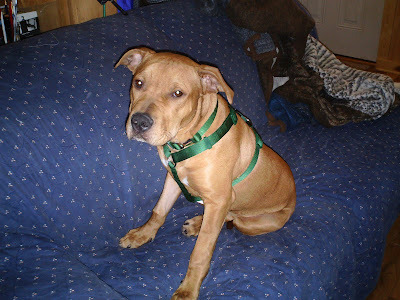 We got a harness for Thor to make it easier to walk him. Well as it turned out I couldn't keep up with him. He gets around minus a leg quicker than I do. He was even going up the hills after Scooter. I had to get him back on the path so he didn't get the leash caught up in the trees. I think Thor could have taken a longer walk but he took a long nap after we got home. He seems to be adjusting to his new home and brothers very easily. He is very sweet and lovable and gives lots of kisses. On our walk to the pond we noticed the deer scratched through the snow to get to the clover we planted there. The woods were very quiet today. I think most of the hunters left. I only saw a couple cars go up the road. It's sunny today with the temperature at 36 so more snow is melting. Leetonia Road coming in from Gaines is good. I won't find out about Leetonia Road from Leetonia to Cedar Run until tomorrow. I hope this satisfies all the faithful "Lost in Leetonia" readers for now especially Fran. Paula gave me orders to post. I told her she could also post from Illinois. 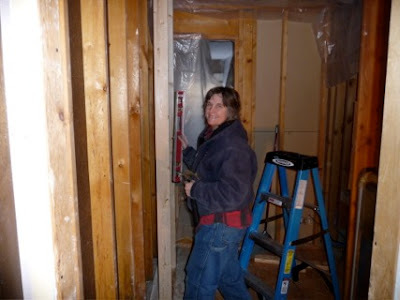 She could post pictures of her daughter's bathroom remodel that Paula is supervising. Signing off for now. Lee and the Boys. As you can see Thor has made himself at home. 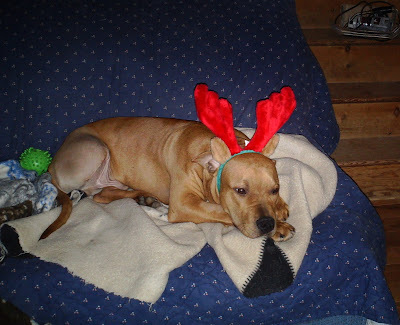 Of course we are already abusing him with reindeer antlers. Such is the price you pay for coming to live with us at Christmas. Thor is six months old and rescued from the woods after having his rear leg shot up so badly it had to be removed. He also had a face full of quills. He hops around well but is still healing and not able to keep up with the other dogs yet. As you can tell nothing much bothers him, which is amazing if you figure in his bad experience. I have a feeling this dog will teach me a lot about forgiveness and healing. He is pretty amazing to watch. So Thor and the boys are ready for Christmas. We put a small tree up outside today. My back isn't up to our usual large one. If you are up in the woods stop by and give Thor a hug.. he gives loads of kisses out for them. Mountain girl, Paula, logging out. Well it was a tough first day for buck season. The weather was slushy and hard to get around in. The roads were very hazardous. The temperatures however were quite warm and much of the snow melted in the low areas. The traffic was a problem getting in and out but we managed to go to town for my Physical Therapy appointment. Tomorrow I head to Rockford, Illinois to be with my daughter for a couple weeks and work on her project. So Lee will be in charge of anything that gets posted. We also picked up Thor yesterday so we are now a three-dog household. We have become outnumbered by the dogs. Thor is very sweet and seems to get around good on three legs. Leo's nose is a little bent out of shape accepting another intruder, and Scooter just wants him to play. 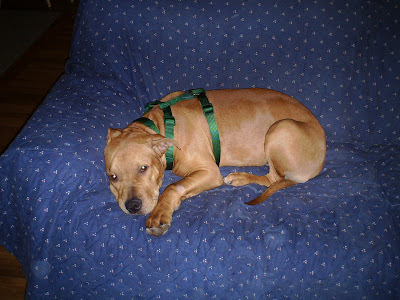 For now Thor is happy to go out a little and sleep on the couch as he continues to heal.